Underbelly fat is one of the most problematic areas and difficult to tone, especially in case of beginners. However, accumulation of underbelly fat is known to hamper flexibility and builds immobility. Body toning is hampered and is also known to reduce overall strength and immunity. There are a number of exercises which are known to help in toning underbelly fat, strengthening the lower abdominal muscles and help in building flexibility. Beginners find these workout simple, they are lesser chances of injuries and helps in improving overall strength and flexibility. This is a quick cardio workout which is known for its powerful and explosive nature. It helps in blasting away calories while it keeps many important muscles engaged at the same time. Squat jumps help in toning underbelly fat in the shortest time, if done on a regular basis. You will start the workout as you stand with the feet a little wide. You will slowly get in a squat position as you start the workout. Your knees shall be just behind the toes and your elbows shall be bent by the sides. You will quickly jump and reach the arms above as you land quite softly. Get back in a squat position. You need to repeat as many times you can in a span of 30 seconds. You need to maintain a good form throughout the workout. Start the workout by moving up your legs. You need to move them towards the ceiling. The legs need to be parallel to the torso. You will maintain a steady posture as you extend the arms a little away from the sides and on floor. Your palms shall be facing a bit downwards. You will start the exercise from this position. Now, slowly inhale and move the belly button close to your spine. You will again gently curl the hips and move towards the torso as you will exhale. You need to move up your hips a little above the floor. Your legs shall be straight in this position. You need to slowly breathe in as you lower the hips and move them close to the ground. You will repeat this movement at least 10 times. 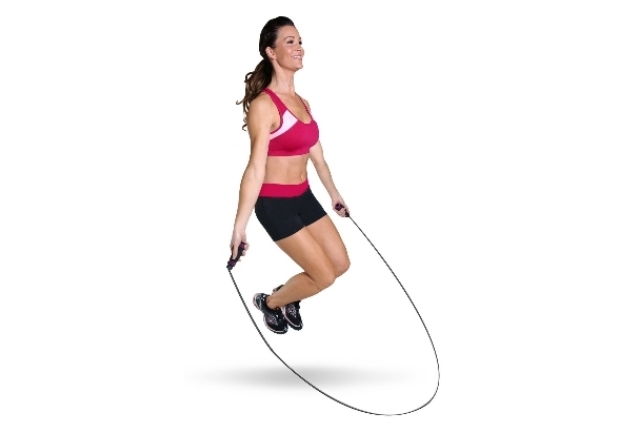 Beginners love skipping related workout, as it includes an element of fun. Skipping is also a good way to increase the heart rate and involve a number of muscles. It is also the quickest ways to burn calories. You will start the workout as you stand in a comfortable position as you keep the feet together. Your arms shall be by the sides. Now, gently, you shall skip a bit forward as you step the left foot forward. You will jump up. Your left knee shall be moved in front of the hips. Your arms shall be swinging as you do the movement. The swinging of the arms adds power to the workout. You will again repeat the workout with the other side. You will complete a repetition in this way. You need to repeat at least five forwards and again five backwards. You need to repeat the movement as many times you can in a minute. This is quite an effective workout for toning lower belly fat. Start by lying down on the back. Your face shall be up and your legs will be bent at a 90 degree angle. Your arms shall be extended by the sides. Your palm shall be on the top of towel. Slowly exhale and then lift the head and shoulders above the ground. Your pelvis shall be tilting up and your hips shall move above the floor. You will draw your knees in and move them close to the nose. You will again move the lower hips down as you get back to the start position. You need to repeat at least 10 times. This workout is also known as total plank twist. You will first get in a plank position. Your feet will be together and your weight shall be shifted a little back. You will start from this position. Now, slowly bend from the elbows. You will bend the right knee and then move it across the direction of the left elbow. You need to ensure that your hips are moving around with you. You will again return the leg in a plank position and then repeat the workout with the left leg. This will be your one repetition. You need to work on three sets and repeat at least 10 times.